With every NHL draft, there is in inevitably a handful of guys that we look back on and ask “how did no one select him in the first round” – I have a strong feeling that Ivan Lodnia of the Erie Otters is going to be one of those players. 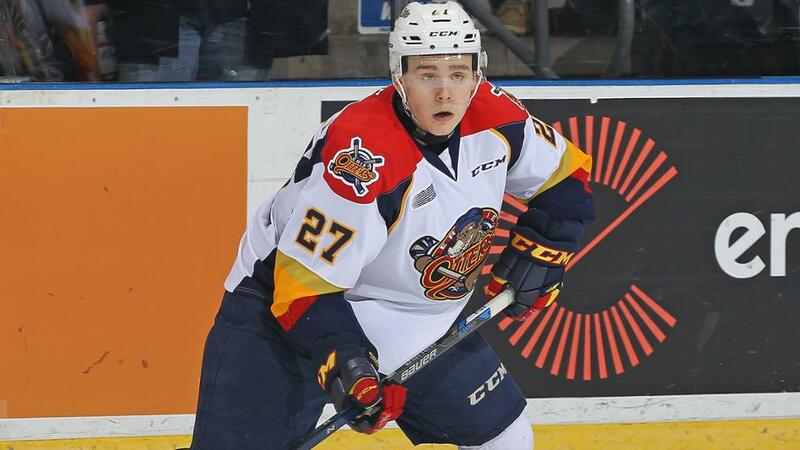 On the precipice of a birth in the Memorial Cup, when hockey fans think of the Erie Otters, the inevitably think about superstars like Dylan Strome, Alex DeBrincat and Anthony Cirelli. Lurking in the shadows, however, is an ultra-talented right-winger. Playing mainly in a secondary role in Erie, Lodnia is the kind of player that is set for an explosion in production in his draft+1 season. With Strome, Taylor Raddysh, DeBrincat, Cirelli and Warren Foegele set to graduate to the pros, the Otters are going to rely heavily on Lodnia – and he has the talent to take the new role and excel in it. Born in Los Angeles, California, Lodnia played his minor hockey in Michigan before being drafted in the first round of the OHL Priority Selection draft by Erie. He is listed at 5’11, 180lbs, but plays a game that you usually see from a bigger player. He is strong and sturdy and has a great ability to use his strength to protect the puck and hold onto possession long enough to create scoring opportunities. He is quick and creative with the puck – offensively, Lodnia plays with an attacking mentality that manifests itself through decisive drives to the net. He is a very instinctive player that know how to get to the right spot on the ice – and has the physical talent to execute the right play when he sees it. He’s got good vision and the ability to make a quick, accurate pass to set up his teammates. He’s smart enough to know when to make the switch from playmaker to sniper – something that is helped out by a well above average wrist shot. Playing up in the lineup, he saw both even strength and powerplay time with Raddysh and DeBrincat early in the season – but was bumped down some nights once Dylan Strome returned to the Otters lineup. With enough high-end skill to mix and match lines from game to game, Lodnia saw ice time with all of Erie’s star forwards – in which he showed that he belonged with the most talented players on the team. When Erie added more high-end talent at the trade deadline, Lodnia looked at home on the most powerful second line in the CHL. Playing a lot with Foegele and Cirelli, Lodnia’s production spiked and he became the Otter’s best forward many nights – and that’s saying something on a team this talented. He’s had a rough go in the playoffs – and knowing the old-school mentality of many scouts, that’s going to hurt him on draft day. With only 2 goals through Erie’s 21 games, Lodnia has seen his ice time dwindle. Luckily for him, he’ll have a chance to shine on junior’s biggest stage at the Memorial Cup in a couple weeks. Ranked 35th by Future Considerations and 34th among North American skaters by NHL Central Scouting, Lodnia is going to fall into the second round of the draft this June – though many believe he shouldn’t. I had a scout tell me earlier in the year that Lodnia was one of the most talented ’99 born players coming into the OHL, and he’s done nothing to change that opinion. At the deadline, the Cirelli trade almost fell apart when Lodnia looked to be the centerpiece of the package going back to Oshawa. Erie insisted on substituting Allan McShane – a high-end 2018 draft prospect – so they could hold on to Lodnia. Living in the shadow of older superstar teammates is not always easy for young prospects – but Lodnia has done well to bide his time and show how much talent he has when given the opportunity. He’ll get drafted this summer – my guess is very early in the second round – and end up making an NHL GM look very smart when he’s up near the top of the OHL scoring race next season.